Portal was the only product that allowed us to migrate nearly 200,000 assets without altering our workflow. Red Sox Productions is the media production arm of the Boston Red Sox. Operating out of Fenway Park, they produce and deliver industry-leading content including the Red Sox Report for New England Sports Network, web videos for redsox.com, Sox In Site, game day production for Fenway Park’s video boards and other special video projects for the club. The strong work ethic and exceptional talent of Red Sox Productions has led to 15+ regional Emmy Awards. When you think of the Boston Red Sox, you think baseball, Ted Williams, and David Ortiz. You think Fenway Park. What you don’t always think of is the media logistics of capturing and documenting every moment of every game. Most of the media captured doesn’t always have an immediate need or project associated with it. As a result, their asset management and storage needs are greater than most other twenty-person production houses. They need resilient systems where media can be searched and revisited at a later date. In January of 2011, 1303 Systems deployed Final Cut Server for Red Sox Productions. This met their needs and also unleashed their productivity. Fast forward to 2014 and finding a replacement with quality support and the ability to preserve existing workflows were at the top of the production team’s list. 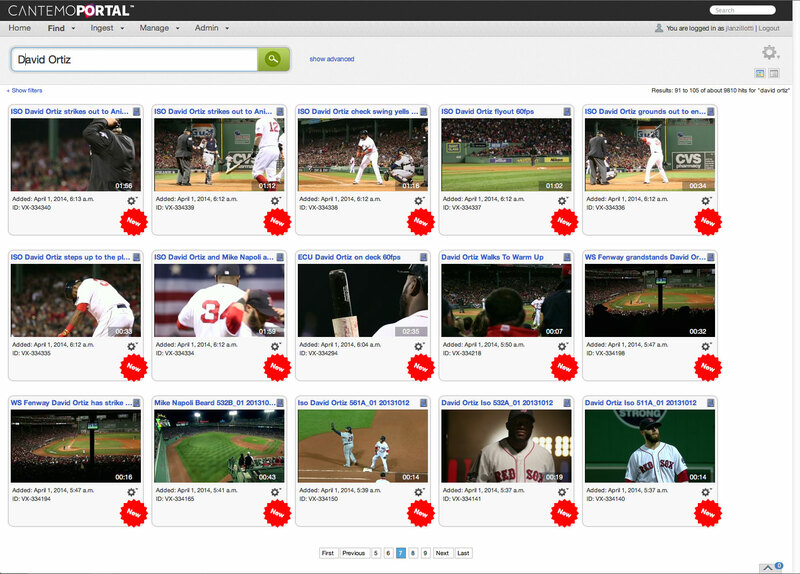 Portal was not just a replacement for Final Cut Server, but a comprehensive new tool that could transition the Red Sox workflow, expand accessibility, and empower their creative team to get content to market more efficiently. The workflow 1303 helped us to build in 2011 is solid. When considering replacements for Final Cut Server, we were looking for a product that would allow us to preserve our current workflow, while also addressing Final Cut Server's weaknesses. The Red Sox did extensive research looking for a product that would replace Final Cut Server without impeding their productivity. Ultimately, they picked Cantemo Portal™. Portal stands out in a crowded marketplace in several areas. It offers enterprise-level features for organizations of any size. At 20 users, Red Sox Productions didn’t fit into the traditional enterprise space, but in terms of workload and quality of production, they are industry leaders. The 162 games that the Red Sox play each year generate extensive amounts of footage for archival purposes. It is not uncommon for the Red Sox to acquire a player they have faced in the past and need to pull footage from years ago. The metadata support in Portal simplifies this task and Portal’s thumbnail sequence preview is immediately available on the search results page. If a thumbnail preview isn’t sufficient, a proxy is just a click away. No download necessary. Cantemo Portal met our needs unlike any product near or below its price point. Portal met us in that middle ground; it can handle the size of our library, but it didn't price us out of the market. Red Sox Productions has roughly 200 terabytes of media spread over two storages. Their primary editing storage is a 25TB Xsan Volume while their near line disk archive is currently 180TB of Isilon scale-out NAS. The migration of assets from production to near line is automatic and seamless, based on asset age. When needed, users themselves can request that asset be brought back to the production storage with a click of a button. Portal easily enables the team to catalog and manage 60,000 new assets each year. Currently, they are in the process of ingesting fifteen thousand tape stock assets that were collected before they transitioned to HD in 2011. Portal allows us to migrate to a new system without abandoning our workflow. Training our users on Portal is simple because its workflows are almost identical to our current operations. And frankly, Portal is easier to use than Final Cut Server. 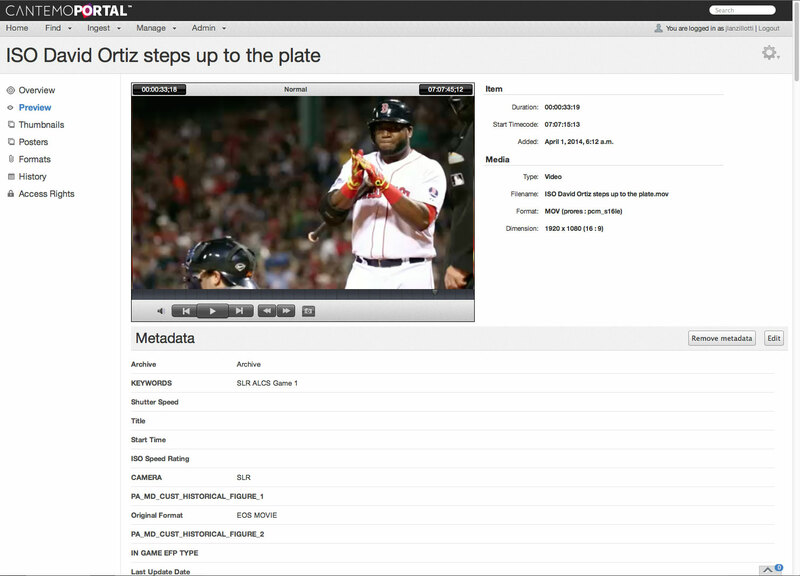 Portal has allowed Red Sox Productions keep the good parts of their Final Cut Server workflows, while providing them with enhanced features that will make their jobs easier. Portal works within any modern web browser, it is aware of the Red Sox shared storage, and the ingestion process is greatly simplified. Selecting assets and mass-tagging them as a group was something they wanted and Lanzillotti says is now easily done. We are very proud that Red Sox Productions, an industry leader in major league baseball sports production, are using Portal to leverage their workflows and to streamline the process of ingest, editing and delivery to the fans. This is yet another example of how the flexible infrastructure of Portal fits right into different markets. 1303 Systems is a consulting firm specializing in media and entertainment production. Everything from editing systems, storage, media asset management, and workflow design, 1303 strives to provide excellent solutions for any client.